When we think of Cincinnati’s Beer Barons, most of us see their sprawling downtown Over-the-Rhine breweries. But what we forget is that those breweries required huge quantities of barley and hops to brew the beer. And that wasn’t grown downtown. You couldn’t just go to Listermann’s and pick up all your brewing supplies, pre-malted, canned and ready for worting. These ingredients had to be grown and sourced locally on the farm. Before Prohibition, the area north of I- 275, now known as Union Center, was teaming with hundreds of thousands of acres of brewing crops to supply the downtown breweries. West Chester, Mason, and Liberty Townships were the areas with the best farmland in the area. Butler county has had a long history of agricultural dominance in Ohio. Hamilton, Ohio, fathered some great agrigultural equipment companies that innovated farming across the country. So, the smart and savvy Beer Barons decided to buy farms in this area and grow their own supplies of barley and hops, creating vertically integrated breweries. German breweries, fueled by the large influx of immigrants, were opening up all over Cincinnati and the demand for barley was great. The problem was that barley was hard to grow and required a lot of special attention. Farmers were reluctant to plant it and the competition for barley supplies was growing each year. In 1900, 4 of the 5 largest malting houses in the country were located in Cincinnati and the majority of the malted barley grown in Ohio was grown in southwest Ohio. But today no malted barley production occurs in Ohio. Back then, brewers like Moerlein, Hauck, and Mulhauser all bought summer farms north of Cincinnati. Hop farms were big business too in Cincinnati. The brewers were probably growing versions of what today are known as Saaz and Hollertau hops. Most of the brewers were from the kingdom of Bavaria, and carried these native hop rhyzomes with them to America. Some of these hybrid native hops are still probably growing wild in the areas of these old summer farms off of the Union Center exit. The soil and climate of southwest Ohio are particularly hop friendly. I can attest to this. I grew three hop varieties (Saaz, Hollertauer, and Cascade) prolifically off my parents’ back porch in college, near Butler County, until my Dad ‘accidentally’ mowed them down. Today, though, most of the commercial hop growing takes place in the Pacific Northwest with varieties like Mt. Hood, Williamette, and Cascade, named for their growing region. Today’s Cincinnati craft brewers tend to brew more bitter beers, with higher alpha acid content, so the hops of our forefathers would probably not be strong enough to supply the current craft beer market. Before Prohibition, in 1899, the Cincinnati Chamber of Commerce drafted laws to govern fair business transactions, because there were so many hop dealers in the city. Cincinnati even exported hops to Europe to meet their brewing needs. And, local farmers were called to Congress as expert witnesses in 1893 to testify how additional taxes on hops were impacting farmers and brewers. In addition to constant supply of hops and barley, there were several other reasons for the beer barons to own these summer farms. They offered a place for their brewery horses to come and rest and recuperate. Imagine the strain these poor animals endured pulling the heavy brewery wagons up and down the steep hills of Cincinnati. Another reason was a place to build large country homes for the families to escape to during the hot and humid Cincinnati summers and avoid epidemics. Remnants of these farms can still be found north of I-275. John Windisch and his partner, John Hauck together bought 400 acres of land in 1876. The partners went their separate ways and the land was divided. The Windisch farm was located between Crescentville Road and Allen Road. The original home burnt down and was replaced by the large red brick home that still stands on Windisch Road. Hauck’s farm was adjacent to Windisch’s farm and stradled Butler and Hamilton counties. The stately Victorian mansion on the corner of Crescentville and Mosteller Roads was the summer home of the Hauck family. It was even bigger than their downtown mansion on Millionaire’s Row on Dayton Street, now owned and being restored by the Cincinnati Preservation Association. 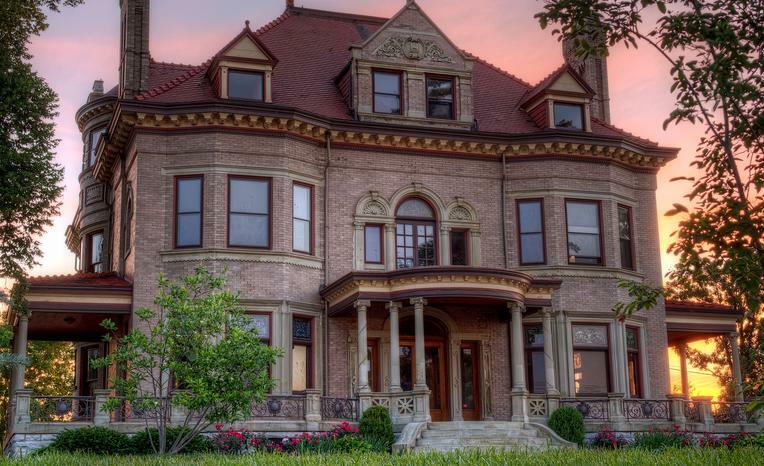 Built in 1904 by Louis Hauck, the son who inherited his father’s brewery, it has 22 rooms, nine fireplaces and tons of stained glass, ornate carved woodwork and tilework. It was used for many years by members of the Hauck family including Frederick Hauck, one of Cincinnati’s most famous philanthropists. I took guitar lessons there in my college years in one of the Hauck family bedrooms, and witnessed my cousin Kenny’s wedding there to his lovely wife, Karen. At the time I had no idea its role in the history of my favorite adult beverage. The Hauck & Windisch Brewery incorporated near the end of the Civil War and operated for 15 years. Then, In 1870 Hauck incorporated as the John Hauck Brewing Co. Born in Rhenish Bavaria, Germany, in 1826, Hauck came to the United States at an early age and worked at a variety of breweries to learn the art. One belonged to his uncle, George Herancourt, and another was his father-in-law, Mr. Billiod’s, in Philadelphia, after a two year stint in Germany. With his savings, Hauck entered a partnership with Windisch in 1864. This partnership lasted until 1879, when Hauck bought his partner’s share, and continued the business. In 1894 the brewery, at the corner of Central Avenue and Dayton Street, covered nearly five acres, and had an annual capacity of 300,000 barrels. The Christian Moerlein Summer Farm was on the north side of Port Union Road on the border of Fairfield and Union townships with acreage in both. Christian Moerlein, also born in Bavaria, owned a brewery on Elm Street covering three city blocks. He bought the rural property in Butler County between 1870 and 1876. The original house was built on a hill and its driveway was on the township border. After the home was torn down in 1927 it was replaced by a 17-room white frame house with pillars across the front. A nearby barn had the Moerlein name on its roof. Back in the day, the farm could be reached from Cincinnati by either the Miami-Erie Canal at Port Union to the east, or the Cincinnati, Hamilton & Dayton Railroad to the west. 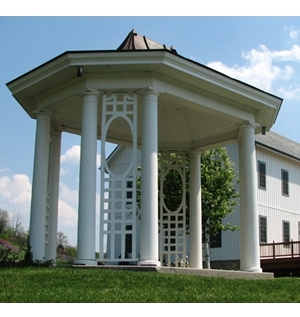 A gazebo that once graced the Moerlein garden at this retreat has been restored and now sits in Beckett Park in Westchester. Still another farm, the Mulhauser farm of the Windhish-Mulahauser or Lion Brewery, was located on Route 4 . 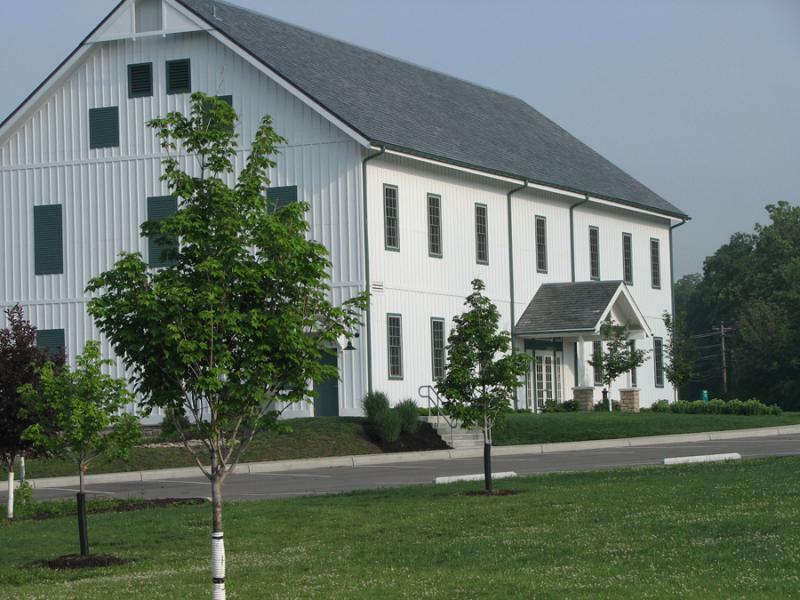 A large two story barn, built in 1881 on their farm was reconstructed in Beckett Park in 2008 as a community gathering and rental facility. The Barn still bears the Muhlhauser name prominently in its slate tile roof. Many weddings have occurred in the former stables of the Mulhauser brewery workhorses. It was the employees of Ohio Casualty, who saved the historic barn. They contacted West Chester Township and descendents of the Muhlhauser family about saving the structure. Working through The Community Foundation of West Chester/Liberty, the Muhlhauser family collected the funds needed to dismantle the barn and move it to Beckett Park. West Chester Township then funded the re-construction and restoration of the prominent timberframe structure -one of last remaining timberframe barns in the state. All of the beer barons who owned these farms were members of a German sport and social club, known as the Cincinnati Turnverein, where their beers were served at events, picnics, and Turnfests. 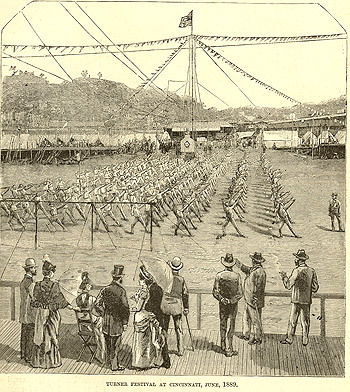 The 1889 Turnfest was sponsored by the Windisch-Mulhauser Brewery and served at the grand festival held at Imwood Park. Professor Eric Stockinger at Ohio State University is working to bring back the barley crop to Ohio. In 2014 his research team planted a half pound of Conlon and Scarlet variety two row barley. It grew and they will be working to expand this new research and educational endeavor in 2015 and beyond. And several hop farms have popped up outside of Cincinnati. Brent Osbourne started a Kick Starter campaign to raisd $10,000 for a hop farm in Monroe, Ohio. His main purpose is to provide fresh, local hops for homebrewers and inquiring commercial craft brewers. Another farm, Valley View hops in Milford, Ohio, east of Cincinnati, grows Williamette, Cascade, Chinook and Mt. Hood, among other varieties. It would be great for Cincinnati and southwest Ohio to regain even a fraction of their pre-prohibition levels of hop and barley farming. Even cooler, would be to find some wild hops growing from these legacy beer baron summer mansions and recreate their legacy brews. ← The Cincinnati-German Pretzel – It’s Not your Aunt Annie’s!